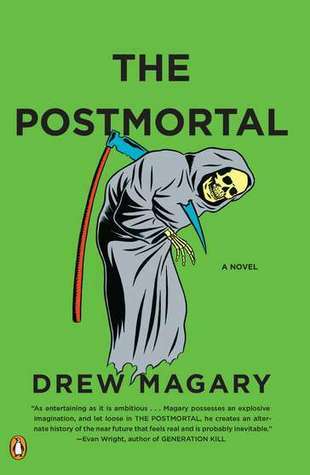 “The Postmortal” is an interesting lil’ science fiction novel with a dystopian slant (and I’m a sucker for anything dystopian, lemme tell ya). The premise of this book is what drew me to it: a world in which a cure is discovered for aging. With an injection, recipients will never age past the day they received their “cure,” and the only death they can anticipate will not be a natural one, but a violent one that they either bring to themselves or someone else brings upon them. We follow one character, John, as he receives the cure in the beginning of the novel, sometime in his early 30’s. The book tracks his trajectory over the next 80+ years through his journal entries (apparently being shared with us from a time even farther in the future) as the society around him pretty much goes straight to hell. The cure for old age has deleterious effects on not only society, but the world as we see the fallout from the fact that people aren’t dying naturally anymore. The world becomes overpopulated, random violence and terrorism increases, resources become scarce, and people begin doing what’s known as “cycle” marriages. Sure it’s weird, but I liked this aspect of the book. If you’re into dystopian lit, as I’ve stated that I am, nothing fascinates you more than watching the planet inch itself toward doom. Seriously. What I didn’t like was the main character, and really all of the characters in this book. Everyone felt rather flat and as bland as dishwater. Society is crumbling around them, yet none of the characters seemed to care, going about their daily business without alarm or feeling the slightest bit scared. As a reader, you’re far more invested in their future than they are, which doesn’t make for the best reading and completely disengaged me from this book. Once again, this isn’t a bad read, but one I wouldn’t necessarily recommend if you’re into an all-around good read.